Warren Minor Christopher (October 27, 1925March 18, 2011) was an American lawyer, diplomat, and politician. During Bill Clinton's first term as president, Christopher served as the 63rd Secretary of State. Born in Scranton, North Dakota, Christopher clerked for Supreme Court Justice William O. Douglas after graduating from Stanford Law School. During World War II, he served in the Pacific Theater as a member of the United States Naval Reserve. He became a partner in the firm of O'Melveny & Myers and served as Deputy Attorney General from 1967 to 1969 under President Lyndon B. Johnson. 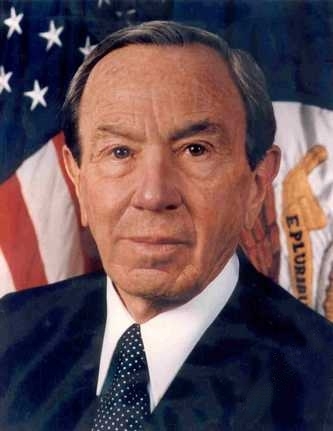 He served as Deputy Secretary of State under President Jimmy Carter, holding that position from 1977 to 1981. In 1991, he chaired the Christopher Commission, which investigated the Los Angeles Police Department in the wake of the Rodney King incident. During the 1992 presidential election, Christopher headed Bill Clinton's search for a running mate, and Clinton chose Senator Al Gore. After Clinton won the 1992 election, Christopher led the Clinton administration's transition process, and he took office as Secretary of State in 1993. As Secretary of State, Christopher sought to expand NATO, broker peace in the Israeli–Palestinian conflict, and pressure China regarding its human rights practices. He also helped negotiate the Dayton Agreement, which ended the Bosnian War. He left office in 1997, and was succeeded by Madeleine Albright.